I recently got several cold emails from the folks at Glassdoor, and the quality of those messages floored me. Here’s an impressive company that urges applicants to put their best foot forward when it comes to business communications. And yet not one but all of the messages I received were carelessly written and completely lacking in terms of specific benefits—cornerstones of a good cold email. As salespeople (or even as marketers), we’re often tempted to overgeneralize emails in the hopes of appealing to a wider audience. And sure, laboring over every single word for every single buyer type is not a good use of time. But neither is copy/pasting the same text into 1,000-plus emails without ever changing a letter. Glassdoor, unfortunately, doesn’t seem to understand this. Let’s go through one of the emails I received to find out where they missed the mark and how they could improve their next campaign. 1. The copy is messy. Remember the days when your email text might reach the recipient in multiple fonts or font sizes because mail programs were less standardized? These are not those days. Cold email is often the first impression you make with a prospect, which means meticulous proofreading is a must before you hit “send.” No blaming the computer, either; those days are long gone. The least this email could have done was include a real first name instead of a generic “hey there.” We have programs now that automate the first-name field. Nor does the message tell me why Glassdoor’s “Enhanced Profile” is a good fit for my company. Maybe the sender assumed I would be into it, which makes me think they didn’t consider me at all—as an individual or as a buyer type. “Smaller companies” is the only phrase that suggests any research was done, and there are as many types of small companies out there as there are font choices in a Google doc. Bottom line: if you don’t consider the person on the other end of the email when writing, they won’t consider you when reading. 3. The benefits aren’t clear. 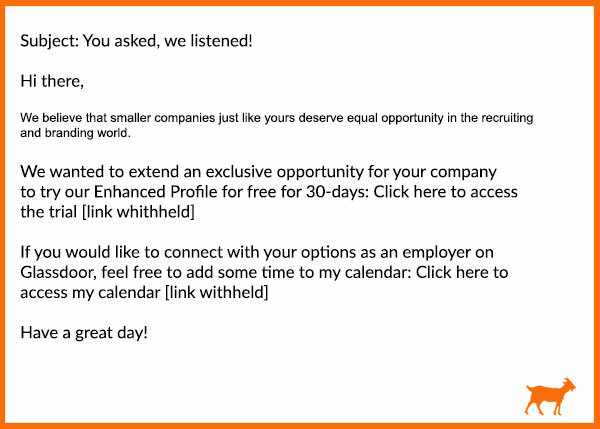 Again, nothing in this email tells me what Glassdoor’s Enhanced Profile is how it will help my company. How will its features improve my business? (For that matter, what are its features?) Will signing up for a trial help me get ahead of competitors? I could guess at those answers, but the whole purpose of a cold email is to take the guesswork out of a product or service for the other person. A lack of benefits is the most surefire way to get a sales email ignored. If you include nothing else, make sure those wind up in the text. 4. There’s no call to action. Telling someone to click a link is not a call to action. In the case of both links in this email, the sender is basically telling me to do the work if I want a meeting instead of asking when that meeting might work with my schedule. People expect to go onto a calendar and book an appointment when it involves a teeth cleaning. In business-to-business sales, it’s usually only the most direct questions that get responses. Something as simple as, “I’d love to explain more about (solution or benefit,) Do you have time this week to connect?” can be very enticing to a busy person. It clearly states what the conversation will be about and that the recipient’s calendar is the top priority here. Bottom line is, if Glassdoor wants to keep their sales efforts on par with their brand’s reputation, a revamped cold email strategy is badly needed.